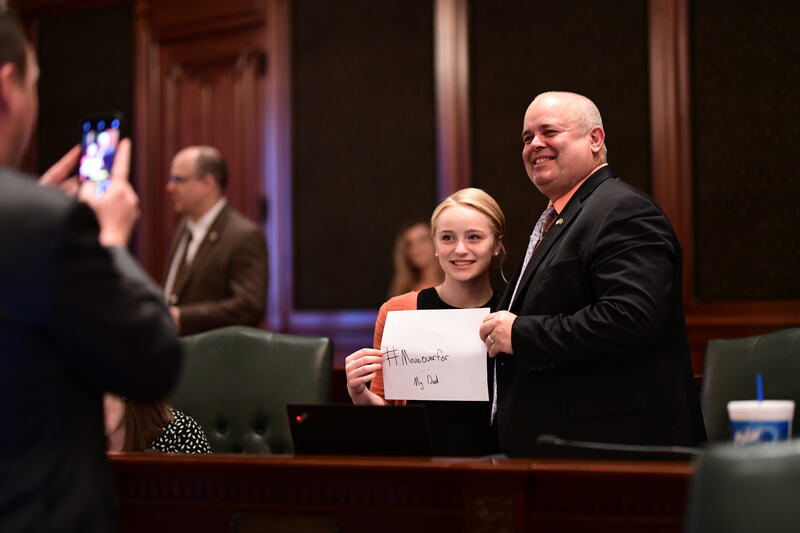 State Representative Dan Swanson honored Lucy Kuelper in the Illinois House on Thursday, April 11, 2019. Lucy is a ROWVA Sixth Grade Student who is active in promoting the #MoveOver movement to protect State Troopers like Lucy’s father. Lucy founded The Move Over Project— a Facebook page and viral social media project on Friday, March 29, 2019. The Project has quickly grown into an internet sensation. Kuelper, the daughter of state Trooper John Kuelper, has seen her Facebook page blossom to over 14,000 “likes” by seeking to raise awareness and adherence of Scott’s Law, the Illinois law requiring motorists move over and slow down for emergency vehicles parked on roadside shoulders. Lucy served as an Honorary Page in the Illinois House on Thursday. Lucy is the daughter of Jessica and John Kuelper, of Rio, and is active in Cheerleading, Softball, Track and is an Honor Roll Student at ROWVA. In addition to school activities, she is also active in 4-H Club, enjoys showing cattle and swine at the local county fairs, is a member of Flipside Power Tumbling Team, volunteers for community causes, and enjoys signing the National Anthem at local events. She has also been recognized with the Illinois Volunteer of the Month.